When his older brother Alastair is branded a deserter having disappeared during The Great War, Ross is coerced into marrying his brother?s English fiance, restoring the reputation of his wealthy South Australian grazing family. Having fulfilled this obligation Ross turns his back... read full description below. When his older brother Alastair is branded a deserter having disappeared during The Great War, Ross is coerced into marrying his brother?s English fiance, restoring the reputation of his wealthy South Australian grazing family. Having fulfilled this obligation Ross turns his back on his manipulative family and unwanted wife and travels to the Northern Territory. He carries with him a tale of Greek myths belonging to his beloved lost brother and the hope of carving his own empire from one of Australia?s last remaining wildernesses. But Ross has not counted on meeting a woman who will alter his life, nor a savagely beautiful land that can captivate and destroy one?s soul. From nineteenth-century Adelaide and the red dirt of mid-north South Australia, to the cattle stations and buffalo plains of the far north Ross?s journey is one of anger and desire, adventure and determination, to the heart of stone country and beyond. 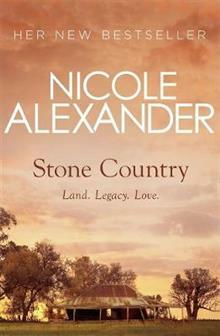 A fourth-generation grazier, Nicole returned to her family's property in the early 1990s. She is currently the business manager there. Nicole has a Master of Letters in creative writing and her novels, poetry, travel and genealogy articles have been published in Australia, Germany, America and Singapore. She is the author of eight novels- The Bark Cutters, A Changing Land, Absolution Creek, Sunset Ridge, The Great Plains, Wild Lands, River Run and An Uncommon Woman.